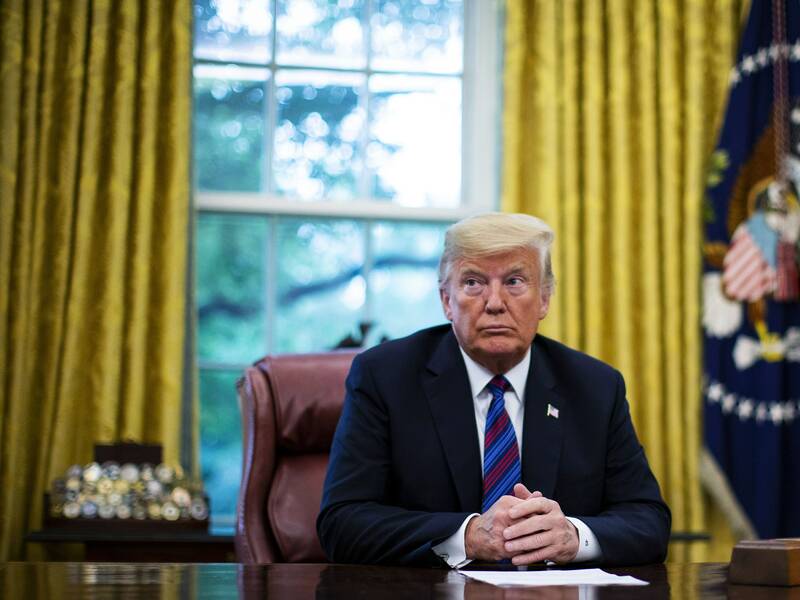 A FULL HOUR before the sun rose in Washington, DC, Tuesday, President Donald Trump fired off a pair of tweets claiming that Google had “rigged” search results against conservatives. Like so many Trump grievances, the argument seems steeped less in fact than in a roiling stew of personal animus. But in Google News, the latest subject of his ire, Trump may have found the perfect target. In Trump’s tweets—which he later deleted, then tweeted again, with no substantive changes—you can see the outlines of an attack that can’t be easily fact-checked or dismissed. Charges of bias against Google will stick, because no algorithm is truly neutral. And while Trump’s logic is specious, effectively countering it would require acceptance among his base that mainstream news sources like The New York Times are not, actually, the enemy of the people. Google search results for ‘Trump News’ shows only the viewing/reporting of Fake News Media. Google News, if anything, appears to be one of the few places left online that hasn’t devolved into microtargeted filter bubbles. In a study published just last month in Computers in Human Behavior, researchers Seth Lewis and Efrat Nechushtai found that Google News recommendations were in fact largely homogeneous, with liberals and conservatives being shown the same links regardless of ideology. In addition, the top five results for news searches came overwhelmingly from a handful of mainstream sources: The New York Times, CNN, Politico, and The Washington Post. It’s that “if” that Trump is leaning on. If you consider everything left of The Daily Caller biased, you’re going to find bias everywhere you look. In other words, they have it RIGGED, for me & others, so that almost all stories & news is BAD. Google doesn’t “rig” its algorithm against conservatives, or against Trump, at least not in the way that he means here. Whether the stories and news it surfaces are “bad” depends on what happened in the world—like, say, close associates pleading guilty to or being convicted of federal crimes—right before you search. A very simple case in point: If you type “Trump” or “Trump news” right now into Google News, the top results all center around this very tirade. The fourth result in a recent search in an incognito window, which doesn’t factor in search history, came from the reliably conservative Fox News. Is Google News rigged, though? Almost certainly not, but you’d be hard-pressed to prove it. That’s because Google search, like Facebook’s News Feed and other platforms, derives its power from an algorithm for which no one outside of the company has any specific insight. That has very real stakes; a 2015 study showed that the ordering of positive and negative stories in Google search rankings could hold real sway over how people vote. Keeping algorithms closely held does have the benefit of making Google’s systems harder to game, but it also gives Trump a huge amount of runway to make allegations that aren’t easily disproven. True enough, at least the prominence part. Lewis and Nechushtai found that CNN occupied a slot in the top five rankings for news stories on Google 12 percent of the time. Only The New York Times had more, hitting 22 percent. But relying on mainstream news outlets rather than the fringes has its own societal benefit. Republican/Conservative & Fair Media is shut out. Again, it depends on how you define the terms. But this sentence features at least two levels of absurdity. Algorithms can indeed be found to be in violation of the law, according to Salome Viljoen, a privacy fellow at Harvard University’s Berkman Klein Center for Internet and Society. But that’s not what’s happening here. If Google’s algorithms did in some way infringe on free speech, that would only be legally problematic if Google were the US government. “You have no constitutionally protected free-speech right on Google. It’s a private platform,” says Viljoen. Similarly, Google would be in legal trouble if its search algorithm were discriminating against a constitutionally protected class, but the 14th Amendment does not cover political conservatives. Lastly, algorithmic bias could be illegal if it somehow caused someone to, say, be turned down for a loan application, notes Viljoen. But since with news results there’s no information being sold to third parties—for example, banks, to continue the hypothetical—that concern doesn’t apply. So, to answer Trump’s question in one word: No. 96% of results on “Trump News” are from National Left-Wing Media, very dangerous. See above. The 96 percent number comes from the PJ Media story, which defines “National Left-Wing Media” as anything mainstream. Yet a study following the 2016 election actually found the candidate who most benefited from mainstream media bias was Trump, since coverage of Hillary Clinton was found to be overwhelmingly negative, and mainstream outlets paid comparatively little attention to Bernie Sanders. Google & others are suppressing voices of Conservatives and hiding information and news that is good. This is a new spin on the argument that Twitter was biased against conservatives because it banned several accountsfor abusive behavior. It’s the behavior part that matters. Or in this case, it’s the thousands of signals that Google uses to determine which sites rise to the top of the rankings. They are controlling what we can & cannot see. By appropriating this argument to his own ends, Trump also shifts attention from the very real conversations that should happen around algorithms, corporate responsibility, and representation. “There are very many real concerns about the influence these companies wield. What’s disappointing about Trump’s argument is that it forces people who want to defend freedom of the press into a defense of the platforms, which deserve a lot of scrutiny. They do exert a disproportionate influence over the information people see,” says Nyhan. “The danger, though, is that they will be bullied into political submission” by Trump and other aggrieved conservatives. That could take troubling forms; look no further than Facebook cowing to conservative pressure and abandoning oversight of Trending Topics, which let unvetted stories run rampant on the platform leading up to the 2016 election. Google News today shows everyone the same stories, projecting a ground-level truth. The alternative: deeply entrenched echo chambers, the kind that have turned so much of the internet toxic. This is a very serious situation-will be addressed! It’s not clear what sort of regulation Trump has in mind here. White House economic adviser Larry Kudlow said Tuesday that the administration was “taking a look” at the possibility—but even the threat has serious implications. Facebook failed that test in 2016. Now it’s Google’s turn. But with its algorithm locked in a black box, and an opponent who views any media left of Breitbart with suspicion, it’s going to be an unwinnable fight.